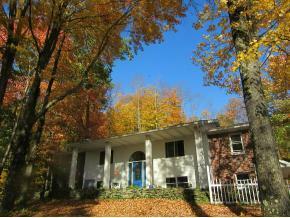 One owner custom built home on almost 8 acres! Nestled in the woods sits this unique home w/ an updated master suite w/frplce & skylights & french drs to the deck, 2 other bdrms complete this wing. The kitchen opens to the eat in area boasting a 2 sided frplce shared by the living rm. The massive dining room has access to the back decking overlooking the land. The barn is perfect for your hobbies! Floyd Bell Elementary School Pre-School, Elementary School / Public 4 2.78 mi. Windsor Central High School High School / Public 7 5.66 mi. C R Weeks Elementary School * Pre-School, Elementary School / Public 6 2.42 mi. F P Donnelly School * Pre-School, Elementary School / Public 4 3.03 mi. Richard T Stank Middle School * Middle School / Public 7 3.75 mi. Susquehanna Valley Senior High School * High School / Public 6 3.75 mi. 443 Zimmer Road, Kirkwood, NY 13795 is a 3 bedroom, 2 bath single family home was sold for $240,000.